A few weeks ago in class, we discussed the pros and cons of emulation and how emulation can be thought of as preservation. I argued that a pro of emulation is that you are preserving games that otherwise would have been lost in time. On the other hand, I argued that by emulating games, you are only preserving gameplay, not the experience of playing said game. Earthbound, released in 1995 for the Super Nintendo Entertainment System (SNES), provides an argument for and against emulation that I want to investigate further. I am currently playing Earthbound on an SNES emulator because it is the easiest way for me to play the game. I do not own the appropriate hardware or software in order to actually play the real game. I realize that I am not getting the full experience of playing the game but I cannot justify spending almost $200 (Price Charting) to play a game that was made over twenty years ago. That crazier fact here is that the majority of that price comes from the game, not the system! Why is Earthbound so expensive? Upon release, Earthbound was not received all too well. When advertising the game, Nintendo decided to mimic the unconventional sense of humor found throughout the gameplay. Ads like this revolved around the stench of the game. Not a traditional way to advertise. You have to keep in mind that this was during an era of gaming that warranted “ads with attitude”. Nintendo was in competition with Sega to win over teenagers with more mature games. Needless to say, the advertising was not very effective and the game only sold around 140,000 copies in the US (compare that to Super Mario World, which sold around 20.6 million) (www.gamecubicle.com). Though the game did not sell well, it was welcomed with a small cult following. Fast forward to today, collectors who are looking to complete their collection, or just have a fun game to play, are looking to spend about $150 to buy just the cartridge. Earthbound is not the only game in this situation. Games like Conker’s Bad Fur Day (N64) and Little Samson (NES) are perfect examples of games that just did not sell well, but are sought after for their fun and exciting gameplay. Games like these provide perfect arguments for emulation. Emulation makes hard to find games more accessible to the general gaming community. Without emulation, I would have no way to experience the quirkiness and absurdity of Earthbound. But what am I missing by digitally emulating the game instead of playing the physical cartridge? A complete in box version of the game. It included the cartridge as well as an important guidebook. 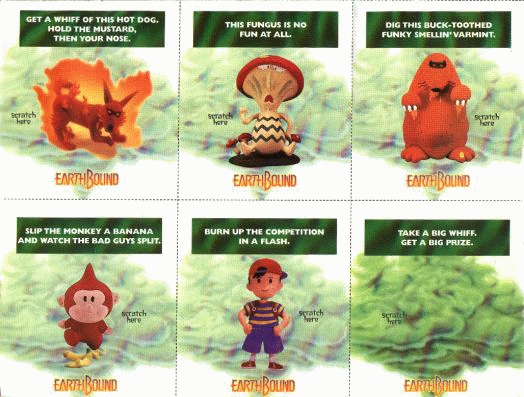 When Earthbound was originally marketed and sold, it ran you about $70 ($115 dollars in today’s money) but you also received an important guidebook that not only taught you how to play the game, but included a lot of unique artwork and secrets that you could only find in that guidebook during the time. They even included scratch and sniff stickers that were part of the advertising campaign. The book included lore and other information about the towns you would be visiting and was overall, a helpful companion as you played through your quest. The book also gave the player tips and tricks on how to progress in the game. You have to remember the internet was in its infancy at this time and if you got stuck in a game, you could not just Google your way out. In an RPG like Earthbound, the path towards progress is not always a clear one. You can see that by emulating the game, you are missing out on the experience that the game developers intended you to have while playing Earthbound. Here in lies the problem with emulation, you are merely replicating the gameplay, not the gaming experience. Of course I could go and spend $200 for a system and game (cartridge only), but I would still be missing the guidebook and would be spending quite the penny on a twenty year old game I could play for free on my computer. Interestingly enough, the developers of Earthbound put some interesting measures in play to combat piracy of the game. An error message appears as you boot up an unofficial PAL version of the game. On unofficial ROM’s of Earthbound, the game will actually display a warning message at the beginning of the game. Thankfully, the emulation software and ROM I downloaded got past the anti-piracy measures but I found some pictures here. Along with a harmless error message, the game will actually spawn more enemies for you to fight. This was in an effort to make the game less enjoyable. But the real measure comes in a more permanent form. If you make it all the way to the end boss fight, the game will freeze, reboot, and delete all your data! Obviously, the developers anticipated pirating of their game so these measures were put into place to encourage players to purchase the real game. This is where emulation gets a bit tricky. Since you are technically not playing original software that you purchased, it is illegal to be playing said emulation. Emulation comes with a negative connotation because you are cheating the developers of the game out of their rightfully earned money. So what makes emulation excusable? Earthbound provides ground for and against emulation. It is one of the few games to do so as well. Emulation has a time and place in the industry, for preservation of older hardware and software that cannot be easily accessed. It is important to keep these relics of gaming history as a way of preserving the culture surrounding these games; almost like a time capsule. But emulation should be used knowing that it is not replicating the experience of playing the game, merely the gameplay itself. Additionally, emulation should be used responsibly and not in an effort to scam developers out of money. I believe my use of emulation is justified because I am a broke college student who does not have a few hundred dollars laying around to spend on “prehistoric” video games I would argue however, that if you have the means to do so, to buy an official emulation of Earthbound on the WiiU’s Virtual Console eShop.